Palmetto Exterminators is proud to be a sponsor of Root from the Roof. 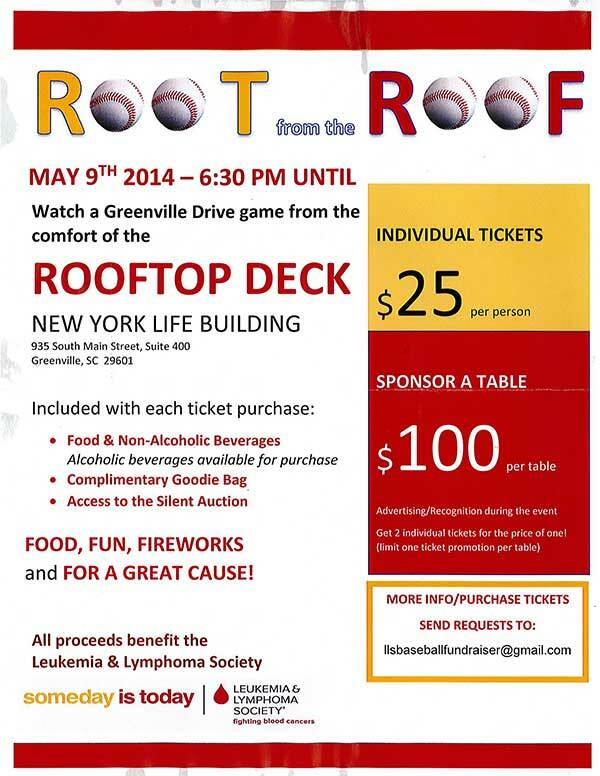 Watch a Greenville Drive game from the comfort of the Rooftop Deck. Our candidate is Michael Jannise, Jr. I joined Mike’s campaign to raise money in memory of my Grandpa, Johnnie Greene and in honor of my father-in-law, Van Hopper. My Grandpa was diagnosed with MDS, a form of leukemia, in October of 2012. Due to the MDS, he was severely anemic and required several blood transfusions through the course of a few months, receiving a total of 16 units of blood. His doctor was able to give him an injection that would not have existed without the research and funds provided by organizations such as LLS. We were told the success rates were very high in younger, more healthy individuals but due to his age and several other very serious health issues, the injection was unsuccessful. After a short but hard battle with MDS, my grandpa passed away on February 13, 2013. My Grandpa and I had a very close relationship and not a day goes by that I don’t think of him. My father-in-law was diagnosed with stage 4 non-Hodgkin’s lymphoma in 2004 and again in 2010. The second time he was diagnosed, because there was cancer in the bone marrow, we were told his only chance of survival was a stem cell transplant. After more than a month in the hospital, a successful stem cell transplant, and months of recovery at home, he is doing well today. When I mentioned to him and my mother-in-law that I was raising money, they told me that they actually received a check from LLS after his stem cell transplant to help with costs! I hate cancer! I hate how it rips families apart and takes those we love. My desire is to see cancer end this side of Heaven. Organizations like LLS are committed to making that happen. In fact, because of LLS, survival rates have tripled and in some case quadrupled since they began their efforts. Will you help me? There is no donation too large or too small. Every donation is tax deductible and not only goes to helping my candidate, Michael Jannise, Jr be awarded the title of Man of the Year but it allows you to personally join the fight against these life threatening cancers. My goal is to personally raise $1000.00. Please help me reach or exceed my goal. My six year old son, Hudson, is making artwork to help raise money in memory of his Pop Pop Johnnie and in honor of his Grandpa Van. If you would like to donate and receive a piece of his artwork, please put “Hudson’s Artwork” in the “your message” section of the donation page along with your address and we will mail your artwork. Hudson’s goal is to raise $250 on his own and is included in my goal of $1000. Please visit my Web site often to see fundraiser events we are hosting and bring friends who would also like to donate or attend events!